The door to developing superior electronic devices, such as flexible circuits, has been nudged open by A*STAR researchers' modeling of possible methods to manufacture one of the crucial ingredients. 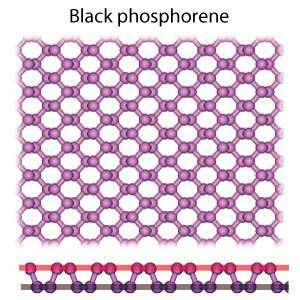 Phosphorene is a two-dimensional (2D) form of the element phosphorus. Despite having electronic properties superior to other 2D materials such as graphene (2D carbon) and silicene (2D silicon), phosphorene's potential for application in high-performance devices has been limited by how difficult it is to reliably produce commercially viable quantities of it in large, thin, high-quality nanosheet form. The new model developed by Junfeng Gao and colleagues from the A*STAR Institute of High Performance Computing will make it possible for researchers to tackle this challenging technical problem by choosing the best process conditions for the growth of large-size, high-quality phosphorene directly on a surface. "The stability of the growing nanoflake is highly sensitive to the substrate and crucial to its continued growth," explains Gao. "If the interaction strength is too weak, the substrate causes the flake to buckle; but if the interaction is too strong, the inner bonds between the phosphorene atoms will break and an alloy may form." The researchers compared the effect of two different substrates on the growth of the phosphorene nanoflake—a copper substrate, commonly used for growing graphene, which bonds with the phosphorene through strong chemical processes, and a hexagonal hydrogen boron nitride (h-BN) substrate that couples with the phosphorene via weak van der Waals bonds. The copper substrate caused the nanoflake to break, whereas the h-BN was unable to stabilize its flat structure. By boosting the strength of the bonding between the nanoflake and the h-BN substrate, their simulations showed that the 2D growth of the phosphorene was maintained. "Our work is the first attempt to explore the direct growth of phosphorene and provides guidance in the search for suitable substrates," says Gao.